The last project we worked on in Watercolor Plus class was wax resist with watercolor. Wax in the form of crayon or a white candle has always intrigued me for the textural qualities the watercolor artist can get from it. I often pick up a crayon when I need a bit of sparkling light in a painting somewhere. Here, the crayons I used were made by Crayola. That’s right, just the ones you find on any store shelf. The wax is all in the sunflowers and their leaves and stems. Make sure you push really hard on the crayon or your paint applications may not slide off the wax. I find it best to do all my wax applications prior to painting but think that more wax can be applied in a layering effect. If you want contrast, however, strive for contrasting colors between wax and watercolor applications. The subject for this painting is just north of me by about 13 miles on my back roads trek to my daughter’s farm. There is a farm on a cross roads that has a gigantic garden and a vegetable stand. In August they have a huge plot of sunflowers blooming right next to the road. It is a site to see! « New Student Art: Watercolor Plus Fun! How lovely those large sunflowers look. They appear to pop right out of the painting. Very nice and fun….I plan to use your technique. I planted sun flower seeds this year but the slugs got to the sprouting plant before I was able to eliminate them. Last year our 6 S.F. plants grew huge heads. they squirrels on the property love the seeds. I tried planting sunflowers and the rabbits ate every single one of them, bilomatthews. Then, about four years ago, milkweed began to grow in that very spot. At first, I removed them until I read about the vanishing of milkweed and the effect it was having on the monarch butterfly. After that, I allowed them to stay. This year, I have 15 milkweed plants growing strong, instead of sunflowers. The scent from their blossoms is like lavendar. The rabbits don’t like them and it works for me. I have even made a stake and wire fence to hold them up when they begin to lean. Last year I had five monarch caterpillars and, even though, I did not find their cacoons I am sure they made it. Many monarchs vist that garden in August….. Thank you for your comment and the wax resist would be perfect for some of the nature work you do! Thank you, Leslie. I really enjoyed reading your experience with the milkweed. I am going to check it out to see if it grows in the N.W. It would be a good remedy to outwit the wild rabbits for a change. Right now, we have the whole world of robin population in our garden eating our blueberries again this year. They out smart us every time we try using a bird proof net! Maybe nature isn’t always aware of the hand they feed from. I had fun really studying this painting and trying to find where you used the crayon. I’ve used a birthday candle in the past without much success. Here you really got the height of the sunflowers. Which scare me a bit. They look a little pre-historic because they are so tall. And scary. The crayon blended in better with this painting than any I have done previously. One crayon is the lemon yellow color along the stems and leaves and petals and for some of the seeds. Also used brown and orange in the seed centers of the flowers. All the turquoise that you see in the painting is crayon, also. Thank you for mentioning that about the tall and scary. I can see that. 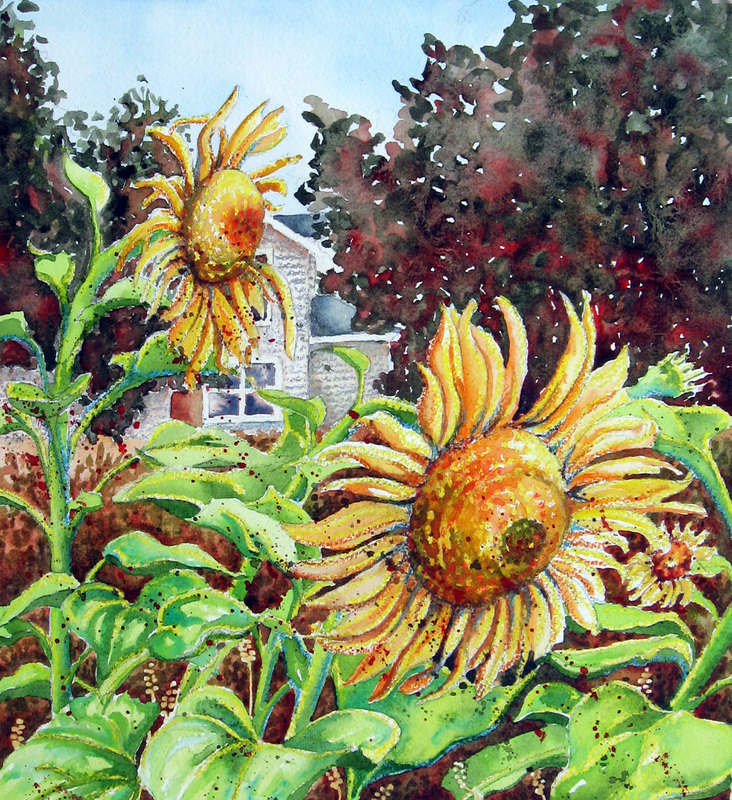 Sunflowers can seem imposing and they move and sway and their petals begin to point like fingers. Neat observation! Great looking flowers! You have got such a close up here pushing back to house, making it a wonderful composition.I tried this technique with regular candle and it didn’t work. Hope to try crayons some day. My first attempts with wax resist didn’t work, either. I finally discovered I was not using enough pressure. I use all my strength to apply the wax from crayon or candle. If I want a thin line of glistening white, I use a white birthday candle because they are so thin. Most of the time, I don’t do entire wax resist paintings but incorporate some wax resist in any painting where it looks like I made need a speckle or a sparkle. Thank you, Padmaja, for your visit and comment! Enjoy your time in California this summer! So much energy in these sunflowers. Reminds me of Vincent. Oh my gosh, thank you Gretchen! You made my day! How pretty! I have tried many times to grow sunflowers, but I guess our “critters” like them better than we do! Oh, me too, Caroline. I plant them and the rabbits have them right off! Thank you! Very cool – love the texturing in this piece Leslie! Thank you for the visit and comment, Doron! I wish I had your courage to try new things. LOL The sunflowers appear quite imposing as they are in reality. I think of you as one who does try new things. You are reaching into that calligraphy pen and working with that and I have seen the beautiful block printing you have done, too! Thank you for this comment, Ruth! What joyous sunflowers – they really stand proud with the warm (Copper Beech?) background. The wax resist has worked so well, especially on the cemtral seeded area. Lovely Summery painting! Beautiful effect, very personal and vibrant!